Ok, so the countdown to exams has started! My Easter holidays started on Saturday and I have four weeks until the dreaded exams start. There is one minor problem- there are builders in our house and the sound of walls being knocked down isn't exactly the ideal atmosphere to do some serious revision. So today I decided to venture outside of my house in search of a more peaceful place to work. I considered the library but I find silent work really hard and I prefer a bit of low level noise. 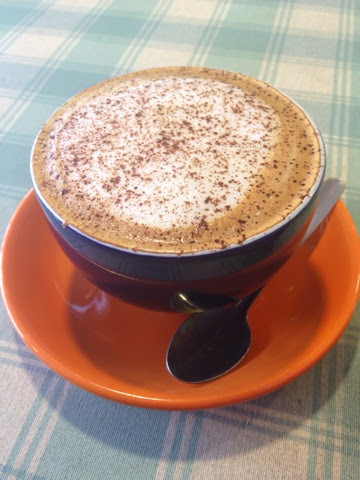 I decided to try out my local cafe so that I could stock up on caffeine whilst working. I'm currently working on a project that analyses the historical accuracy of Robert Harris' "Pompeii". 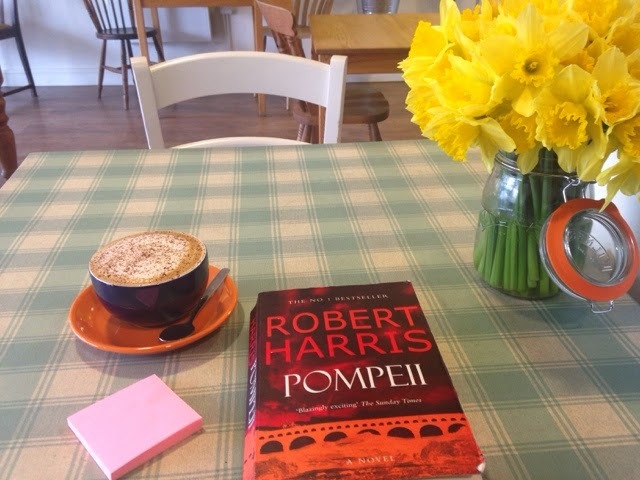 I chose this table because it had a lovely vase of daffodils (oh hello spring) and I treated myself to a cappuccino and set about reading my book whilst furiously taking notes on my post-it's. Do you have any impending exams? Where do you work best?